The war on petrol and diesel cars has been simmering for some time. Diesel vehicles in particular have been singled out with some cities around the world restricting their use. But whilst few would argue that vehicles running on petrol or diesel are polluting, the electric vehicle alternative has yet to tick all the boxes as far as those wanting to buy a new car. The biggest issue for many is the range of the vehicle and the perceived inconvenience of charging up their vehicle. Technology is certainly improving and some electric vehicles, or EVs, can cover more than 400 km. But there are still many drawbacks. The first major issue for many people is one of initial cost. There are very few second hand electric vehicles on the market and thus the only real option is to buy new. The Renault Twizy [pictured above] is probably not what most people envisage themselves driving in. While it is certainly nicely designed it only has capacity to carry two people, and the passenger will find themselves rather squashed behind the driver. The vehicle has a range of 100 km though this can drop to around half in some conditions. With a top speed of 80 km/h [50 mph] the vehicle is perhaps best suited to urban driving though the cost, ranging from £6,990 to £7,400 is likely to put off many [Renault]. Due to the very small luggage space the vehicle certainly wouldn't be much good for to take a weekend or summer break unless one is travelling very light indeed. In fact there's no boot to speak of. Instead a 31-litre lockable storage cubby exists under the rear seat that's large enough to carry some small bags, a laptop or a modest amount of shopping. Another off-putting factor is the fact the price does not include the battery pack. Instead owners have to lease the battery from Renault for a £45 monthly fee, although it does include roadside assistance and a battery replacement guarantee. Perhaps a more practical EV is the Renault Zoe [picture above] which retails at £18,045 up to £23,645, although currently UK buyers get a so-call Plug-in Car Grant or PiCG which reduces the cost. However, the PiCG which gives buyers up to £4,500 towards the cleanest new cars, will only run until March 2018 [Guardian]. 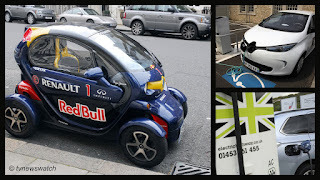 The Zoe has a range of over 210 km [130 miles] but like Twizy owners, one still has to lease the battery which costs between £49 and £110 per month depending on the length of the agreement and annual mileage [Top 5 EVs]. Recharging takes 3 to 4 hours which could prove inconvenient for long journeys. In fact aside the issues of cost and leasing batteries, charging times and range is the crucial issue for most people. Short hops around town is not an issue. It's those journeys to the airport or the weekend trip to the coast or the drive to France on a camping trek which create the challenges. From one side of London to the other via the M25 is around 100 km [60 miles]. So a return trip from the Essex border to Heathrow Airport could be achieved in a Renault Zoe with 16 km [10 miles] to spare. But ideally one would really want to top up before that return journey. There are only 4 electric car charging points available at Heathrow Airport Terminal 5 Short Stay Car Park and herein lies another issue. There are some compatibility issues, but the biggest issue here is numbers. If there is no free space one could very well be left stranded on the M25 without juice. Given there are only 4 charging points, finding them might also prove to be a challenge. There is also the cost. While charging is often free, or very cheap, parking at Heathrow for 2 or 3 hours in order to charge up one's car would likely set one back around £14. That said, £14 is considerably cheaper than the cost of petrol or diesel which would have been burned up in a conventional vehicle. Currently there is no VED [Vehicle Excise Duty] payable on pure EVs worth less than £40,000. So that's a potential saving of anything up to £300 a year. But of course even EV owners have to pay out for an MoT and insurance and withe monthly cost of battery easing with many EVs the running cost per year can easily soar towards £1,000 before driving anywhere. This cost is similar for most vehicle owners however. But unlike conventional car owners, EV drivers do get some perks. Many areas offer discounted parking, such as Westminster in central London where EV drivers need only pay for just 10 minutes on street pay-to-park bays and park for the maximum prescribed period. In some areas a free resident's parking permit for residents is offered for owners of an eco or electric vehicle. And EV drivers do not have to pay London's congestion charge. So there are some advantages and disadvantages. And there is an EV for pretty much for everyone. There is the tiny Twizy which is great as a little city runabout. There is the Renault Zoe and the arguably better Nissan Leaf which both offer comfort and space, and could be considered small family cars. And there are even electric SUVs in the pipeline in the coming years [Business Insider / Autocar]. Currently there are few electric SUVs, but the Kia Soul EV is certainly a vehicle that makes the idea of driving an electric vehicle a little more cool. However with a range of only 150 km [93 miles] in optimum conditions there are serious issues to be considered as regards charging. Indeed, it is charging that is the biggest problem when it comes to EVs. Whether a vehicle has a 600 km range or a 150 km range there needs to be an improved infrastructure, not just across Britain but across Europe and around the globe. Not everyone wants or can afford a second vehicle. So in order to persuade new car buyers to buy an all electric vehicle the infrastructure needs to improve. Whilst there are many charging points across the country not all are rapid chargers. Some are free, some require registration and others require payment through an app or via an online account. So without preplanning one can encounter issues concerning payment even before plugging in. In fact this, and non-working machines, is perhaps one of the biggest problems [YouTube]. Anyone with a regular gas guzzler can drive into a service station, fill up and pay with cash, debit or credit card, or even Apple or Android Pay in many UK locations. But for many EV charging stations one has register, purchase special cards and top-up online. The issue could be solved simply giving users the option to pay with a debit or credit card with perhaps the offer of benefits to those who sign-up to the specific scheme. Then there's plug compatibility though for the most part this is not really a major issue since most charging stations offer the two main types [YouTube / EVObsession]. For those with the extra cash for a second vehicle an EV is definitely the way to go. But for a primary vehicle there are, at present, too many drawbacks. Fast charging stations need to be at every petrol station, supermarket and town centre car parks as well as on-street parking locations. And this roll out needs to be Europe wide. A London to Bournemouth trip might be feasible at present, but it would be a brave soul attempting a European tour with an EV. Today the Chancellor of the Exchequer announced new efforts to clean up the air with further measures targeting diesel vehicles whilst putting forward financial incentives and pledges to build an increased EV charging infrastructure with a promised £400 million fund [Business Green / Huffington Post]. But there are two major challenges that have yet to be properly addressed when it comes to electric vehicles. The first is the drain on the national grid as more people adopt the new technology. The grid recently warned that, by 2030, electric cars could require 3.5-8GW of additional capacity, on top of the current peak demand of 60GW [Guardian]. But there's another perhaps far more pressing issue, and that concerns the battery that powers the vehicle itself. Currently most EVs use Lithium Ion batteries. However, there are only finite Lithium resources. It has been estimated that should EVs really take off there is only enough lithium to supply the market for around 17 years. Back in 2015 the US Geological Survey produced a reserves estimate of lithium which concluded that the world has enough known reserves for about 365 years of current global production of about 37,000 tonnes per year [USGS PDF]. But of course, that did not take into account possible future use [Green Tech Media / Bloomberg]. There is a revolution taking place already in that many people are beginning to accept the new technology. 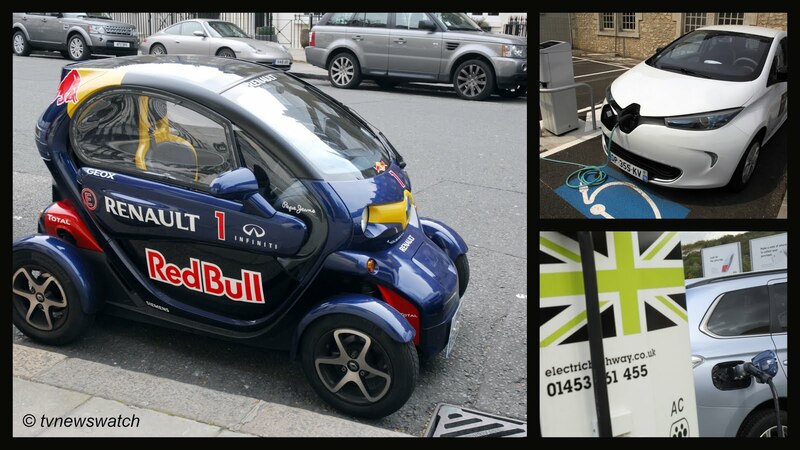 No longer are are electric vehicles geeky, the Twizy perhaps being only one exception. The range is improving and along with it the charging station infrastructure, if a little slowly. But there needs to be a another revolution in battery technology otherwise the the electric car will soon come to a grinding halt [Guardian].